Listen to the music of the Sev Trek Animated Cartoon as well as 6 bonus tracks! Brazilian musician Marcos Kleine, known for his versions of famous film and TV themes, composed and produced the soundtrack. His band, "Kleine Project" is widely known on the Internet. The CD also features Australian band BenHerd (you can download BenHerd's music video clip from their website), with three songs demonstrating their Surf Music Style. 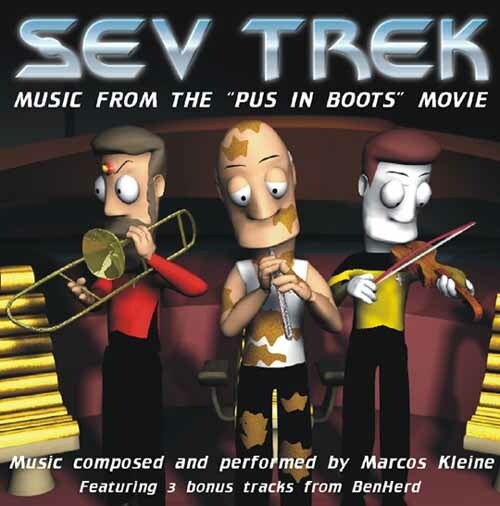 Three "bonus tracks" close the soundtrack - instrumental compositions where Marcos Kleine shows his diversity of styles. To hear a song sample, click on any song title with a . Discount: 20% until May 25.